Charles Mulli is the founder of Mully Children’s Family (MCF) mission that has helped more than 7,000 street children and orphans since its inception in 1989. Mulli’s story is one of a street kid who rose from poverty and suffering to a millionaire and a father to street children, orphans and neglected children. In 1989, he shocked his family by choosing to give away his entire wealth and bringing three street children into their home. Born in a family of nine, Mulli was abandoned at the age of six by his parents leaving him to fend for himself through begging. His heartache never stopped as his parents later left him again when he was nine years, harboring the resentment. A grandparent took him in and unfortunately, three years later the old man abandoned him after giving in to the scourge of poverty. He embarked on the turmoil of life without a family, paying for his entire primary school through odd jobs. Through his hard work, Mulli was able to sustain himself and start a business with his little savings. The business acted as his stepstone leading to his ascendance to success. Through it, he later rose to a millionaire owning real estate, fleet of public service vehicles, a security company, and acres of land in the country. Mulli who had acquired unprecedented success chose to dedicate his life to God and his entire life course since transformed. The turnaround came in 1986 after an encounter with a gang of street children who had planned to steal his vehicle. The haunting memories of the encounter made him dedicate his immense wealth to the lives of street children. Dr. Mulli started the Mully Children’s Family (MCF) in 1989, which he has since supported with his property to care for the street children, orphans and those neglected. Mulli has been celebrated for his philanthropic efforts worldwide; recently a Canadian artist Faye Hall created a portrait of him. The portrait is made up of more than 30 miniature paintings depicting the work his family does in the country. Paul H. Boge authored ‘Father to the fatherless: The Charles Mulli Story’ a biography that explores Mulli’s tragic experience and achievement. In 1999, Robert W. Pierce Award by the World Vision International for his outstanding work in humanitarian and Christian service to the poor. In 2002, Angel of Hope Award by the World Vision International for his humanitarian work to him and his wife Mrs. Esther Mulli. In 2007, the Jubilee Insurance Company Samaritan’s Award presented by the then Minister for Finance, Hon. 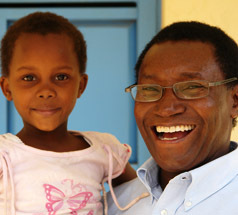 Amos Kimunya. In 2008, Mulli and his wife were awarded with the Med Assets International for their service to the less fortunate. In 2009, he was presented with an Honorary Doctorate degree in Humanities by IMEA/ United Graduate and Seminary, USA. In the December of 2009, he was awarded with the Head of State’s Commendation by his Excellency Mwai Kibaki. In 2011, the former president Daniel Arap Moi presented to him an Honorary Doctorate Degree (PhD) Social Work during Kabarak University’s 7th graduation. This wonderful man deserves the Nobel Peace Prize. I have now read both books about him and have cried buckets with both sadness and joy.